Liking and friending. Linking and posting. Scraping the barrel. Tidying and preening, until every box is ticked. The laptop to the flickering screen. The keyboard to the twitter machine. Perfectly formed in 140 characters or less. With pink highlights and lipstick to match. Colour synched, paypal’d and photoshopped. With tips, lots of tips. Open-hearted advice and 10 top ways to blog or 25 best sky photos ever. Get this app, this add-on, this give-away…..or maybe a plug-in? And back again to the inbox and the the to-do-list and the skype calls, and now VINE!! (Don’t even ask!) Editing, cropping, highlighting and downplaying. And then they wonder why there is no fruit in the bowl, why the house plants are parched for the want of a drink, why the dust is thick on the table? And while they are wondering there is another report to finish, a crisis to solve, someone to call…..
And just when they were hoping for a friendly chat or a piece of cake or whatever else visitors live and breathe for, she is running out the door, because a small bird is exploring a nesting box (the one with the camera inside) and she has to get that shot…..
And they could say, for it would be true, that she works too hard at times, while she connects globally from a soggy spot on the edge of Europe. That she taps and types and never bakes, grabbing every small moment of happiness (in between making it all pay)…….That she foolishly stays up half the night to watch an emergency session of the Dail (parliament) to watch them liquidate another bank? That she is a mine of useless information such as who is head of the International Monetary Fund and why a certain Promissory Note to the European Central Bank isn’t worth the paper it’s written on. When from the muddled, frantic desk, she spies a small robin opening his throat in song, and a whole nation of bankrupt citizens throw back their heads and raise their voices to join in…….. I am totally with you! But sometimes is scary, how all that creative process eats up everything and longing for the perfect golden middle. But is it possible??? I agree! It is a bit scary and that perfect golden middle is elusive at the moment! Beautifully written and I am completely with you on all of the above. I've noticed social media has made me very anxious. A couple of days away just highlights how stressed it makes me, and how much I don't need to check my e-mail, Facebook or Twitter every 20 minutes. We need more calm and less cords in our lives. one of your iconic posts! That finding the balance with social media. I'm having to discipline myself. Now, I will only read the backlog of blog posts in my Reader. So many, like this one, I want to savour and enjoy. Then when the summer heat has withdrawn its sting from the day, I will return to RL and grey-watering the roses. perfect thoughts for my early morning here in the western side of the U.S. I woke up at 3:30 and couldn't get back to sleep, my brain was spinning with all the "this and that" of all the million and one things needed to get done and do -and much of it is a list I have created (or done to) myself. thanks for your thoughts. How clever of you to put into words my predicament exactly. I am not sure if blogging and linking in to the social media is the best or worst thing I have got myself into. I too can relate to this. Blogging can take up a lot of time! 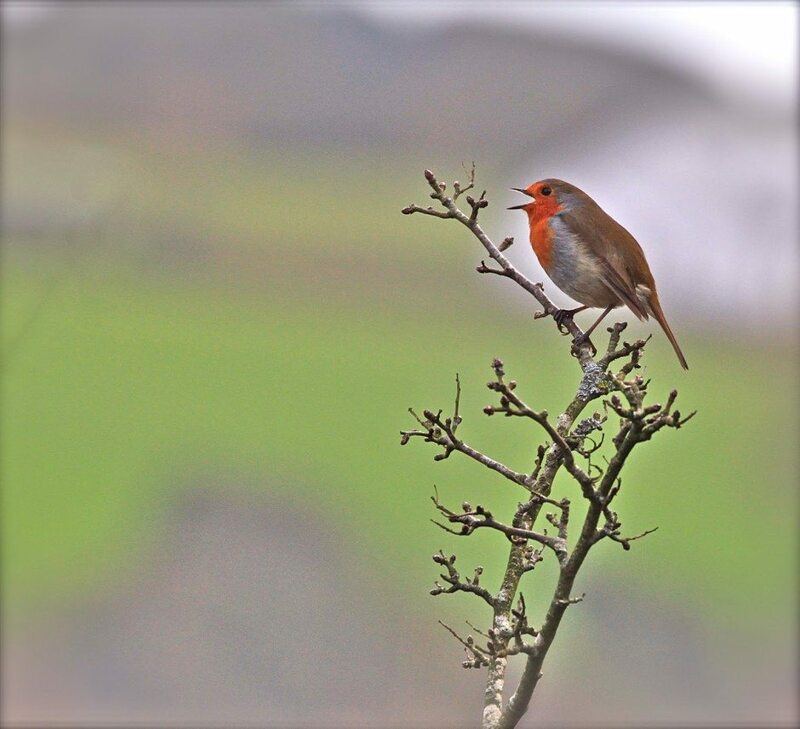 Love the photo – can almost hear the robin's song. I stopped for a moment last Friday to gaze ata robin singing. Mesmerised until life clicked back into 'go' again. Enjoyed this very much, thanks. This made me smile as I recognised myself in this! Although I might spend more time than I should on the internet – there are benefits apart form not doing so much housework! Meeting lots of wonderful people all over the world and spending more time outside looking for wonderful things and places to photograph. So true. We spent so much time in the virtual world, with virtual friends (some of whom become 'real'), enticed by likes, votes and comments, that we sometimes neglect the real world and our real lives. Perhaps we are doing too much, trying to have it all, motherhood, career, creativity, connections. I just started following your blog – via Facebook…from another page I've "liked" I saw yours…"liked" yours on Facebook, then followed your blog!!! And so it goes…the virtual world!! But because of that – I have found some wonderful words and pictures and people! So, with that said – great blog today! And what really caught me is the picture of the singing robin! I love it – so perfect!!! Thank you for sharing! Love it! yest dust and mountains of dog fur hastily swept under the sofa are a sign of our times. I, too, am guilty of spending too much time on the computer. I love the people I have encountered through blogging. All I know is that if I ever took a photo as beautiful as this one of the robin I would consider myself "arrived." It's seriously joyous and made my heart skip a beat when I opened you blog post. Wonderful post that I think that we can all connect with and the wonderful image of the robin, my favourite bird, to accompany it. Thanks. I agree that time spent on the internet is a different than time spent actually living our lives. But no one ever has had enough time for everything they wish to do. Our lives are all about the choices we make with our limited time.